Opening address by Raymond Mnguni, Chairperson of the Steering Committee for the new trade union federation, 21 April 2017, Boksburg Comrade Chairperson, delegates, visitors and friends On behalf of the Steering Committee I welcome you all to this historic gathering. It is a great honour and privilege to be asked to deliver the opening address of such a momentous event. The long wait is over. The new dawn has broken. A milestone has been reached in the history of the South African trade union movement. We are here to build a new, vibrant, independent, democratic and militant workers’ federation. We are here to lead the struggle against exploitation, mass unemployment, poverty, inequality and corruption. We are here to forge ahead in the struggle for the total liberation of the working class from the chains of its capitalist oppressors. As the Steering Committee report documents in great detail, this congress could not come at a more crucial time. Workers face the most serious crises since the end of apartheid. 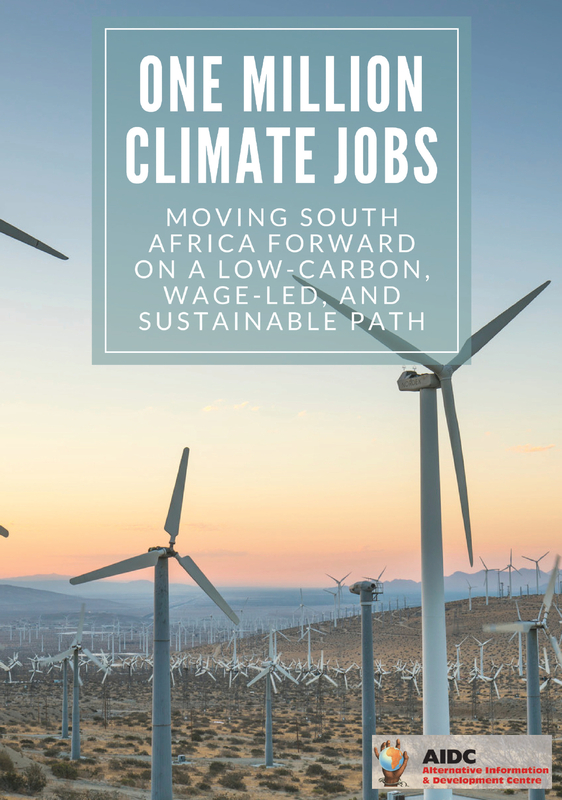 Unemployment is at one of the highest levels in the world, and now thousands more jobs are now under threat – in Eskom and related transport services, the chicken industry, cold drinks manufacturing and the media. More and more of the jobs that remain are insecure and low-paid, as formerly permanent jobs are lost through outsourcing, casualisation and exploitation by labour brokers. An army of vulnerable and marginalized workers is growing fast. Employers and the government are striving to sabotage collective bargaining and drive down wages to the lowest level which desperate workers will be prepared to accept. They are moving through Nedlac to restrict our basic, constitutional right to strike. Yet just when there is a greater need than ever a strong, militant trade union movement, the existing ones are fragmented and weak. According to the Department of Labour, in February 2016, there were 182 unions registered in our country, with another 400 unions were waiting to be registered. There are also thousands of workers in unions which are letting them down, workers who are demoralised by their leaders’ inactivity and opportunism, especially those in COSATU, who are embroiled in factional battles within the ANC and government and have failed to wage any fightback against their allies’ pro-capitalist and anti-worker policies. Worst of all, more than three quarters of workers are not organised in any union at all, most of them in the most vulnerable sectors – part-time or casual workers who have no permanent employer of workplace, farm and domestic workers, the very workers in the greatest need of a strong trade union. That is why one of our main tasks over these three days is target these vulnerable workers, to revive their hopes and give them a route out of their misery. We must recognise the changing nature of the labour force, move beyond traditional areas of scope and recruit these vulnerable, unorganised workers. All these, and many other challenges will be discussed in much greater detail in the discussion around the Steering Committee Report later today. But my mandate is to give a brief summary of the history of the activities of the Steering Committee and how we have arrived at this historic congress today. In 2014 members of the COSATU Central Executive Committee voted to expel 340,000 members of NUMSA, and in 2015 to dismiss its General Secretary, Comrade Vavi. A group of COSATU affiliates which opposed these decisions, later to be known as the “9 plus unions”, worked together to try to restore democracy, accountability, worker control and political independence to COSATU. Meanwhile hundreds more members and officials were expelled from individual COSATU affiliates, many of them for exposing corruption and the embezzlement of union funds, others for their opposition to the COSATU leaders’ policy of propping up a dying and irrelevant Alliance, and an ANC and SACP that had abandoned their historical mission. It became clear, particularly after the two disastrous COSATU Congresses in 2015, where FAWU and other members of the 9-plus fought bravely to turn the tide, that the leadership clique of COSATU would never accede to demands for worker unity, democracy and independence. They were never going to be the driving force for workers’ unity and or fulfill the historic call for “One Country, One Federation”. A new force for workers’ unity started to emerge. Discussions began between the Presidents of NACTU, FEDUSA and the former General Secretary of COSATU, who mutually agreed to convene a meeting of all unions that endorsed certain principles, including that the unions must be independent from employers and political parties, worker-controlled and democratic. A historic meeting on 7 September 2015, attended by 26 unions, agreed to search for unity on the basis of trade union independence and democracy. This meeting laid the basis for working towards a Workers’ Summit and the eventual formation of a New Trade Union Federation. A Steering Committee was elected, comprising leaders of all participating trade unions. Unfortunately almost immediately after the establishment of the Steering Committee, FEDUSA backed away, without ever making a written commitment to the New Federation and its principles. NACTU remained in the Steering Committee and participated, together with some of its affiliates (including AMCU) in the magnificent Workers Summit, which took place 30 April 2016, attended by 1500 trade union representatives, representing 52 unions attended together with 22 civil society organisations as observers. NACTU also participated actively in the May Day Rally convened by the Steering Committee the next day, 1 May 2016. However, it then also retreated, as did Solidarity, who enthusiastically attended the Workers Summit and endorsed its final declaration, but then retreated, apparently back into the Afrikaner Laager coordinated by Afriforum. The Workers Summit adopted a declaration called for concrete steps to be taken to launch a new, militant independent trade union federation and agreed to adopt the following founding principles, which of course you, at this launching congress, may endorse, amend and or reject. 1. Independence: Unions must be independent from employers (in the private and public sector) and from political parties. This does not mean that unions are apolitical. 2. Worker control and democracy: Unions must be worker-controlled and practise democracy, accountability, transparency and be tolerant. Within the federation affiliates must have autonomy but not independence, but differences of opinion must be tolerated. 3. Non-racialism and non-sexism: Unions must fight for the maximum unity of all workers and reject all divisive and negative sentiment such as xenophobia etc. 4. Financial self-sufficiency, accountability, and opposition, in word and deed, to business unionism, corruption, fraud and maladministration within its own ranks and in society as a whole. 5. Anti-imperialist and Internationalist: Unions must place a high priority on international solidarity. 6. Socialist orientation: Unions must be ready to engage in the transformation of our societies to counter capitalist exploitation, inequalities and poverty. 7. Militancy in fighting for the working class and the poor: Unions must be ready to actively campaign for change, and made links with all of the oppressed South Africans. 8. Effective organisation and representation: Unions must organise in the most effective manner to represent workers and serve their interests. 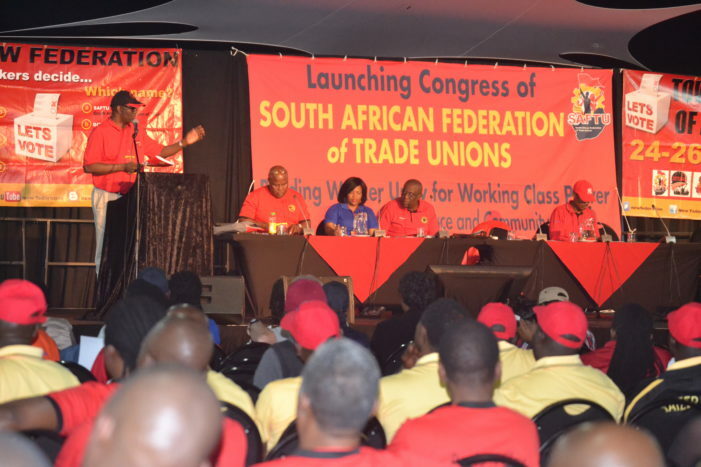 To prepare for this congress of the New Federation, the Steering Committee on 7 March 2017 applied for registration with the Department of Labour, under the name of the South African Federation of Trade Unions. All documents, including membership affiliation, were found to be in order, and the Registrar wrote to the Convenor of the Steering Committee on 23 March 2017 to state that the registration application was successful and the registration was gazetted on 31 March 2017. Should the congress decide to adopt a name other than SAFTU, the name change will be submitted to the Registrar. We still face immense challenges, which the new leadership will have to confront urgently, because time is not on our side. We have to confront the quadruple challenge of unemployment, poverty, inequality and corruption and revive the trade union movement. If workers cannot turn the tide and fight back against their appalling conditions of life, we shall slide into a new age of barbarism, and even worse exploitation of the working class and the poor. I wish you all a highly successful congress. It must be the starting moment of a new era of progress towards the realisation of the ideals of the Freedom Charter and the emancipation of the working class and the whole of humanity. Hi, can you please let me know how to join the federation. I don’t belong to any organization. I live in kimberley, Northern Cape. Scope your company falls under? This will help me to locate which union under SAFTU YOU MUST BELONG TO. My contact: 079 524 0477.
please i need the contact details of this new federation especially the for recruitment department and we need them urgently ,please help. Cn u pls start at de wherehous ,there is more coruption ther pls I have fill de pain En I’m going to feel a pain cos I work BT I feel like a slave I’m still at apartheit,I dnt have any rigts or union . hei guys we hope this is the beginning of UNION that is going to put the people before political parties and leaders, the messes are being exploited, slavery under the ANC gorvenment and COSATU, how can i get hold of you and join the UNION, I think you will help what is killing us as employees in Cptwn. Hope the federation will advance the needs and wishes of workers. conduct its business in a fair manner. handle the differences of affiliate unions. increase membership, Manage the its affairs according to principle laid down by the Department of labour and the constitution. Now our focus is to heed the call of the working class and Cde Thobela Give your contact details so we can keep in touch, 079 524 0477. As for Samuel you are trapped at the wrong place as i refer you as an unorganized. Just give me a call and i will be in touch with to recruit you to your right union you can peace fully belong to. If you keep quite you’ll be asked why and if you tend to disagree you are labeled as an enemy. COSATU has lost morals and ethical codes of its own workers’. I have fought racism in this country and I am still fighting it but one thing I cannot tolerate is fighting tribalism, I hate it. Tribalism is alive in the ANC and COSATU is quite about it cause the majority of CEC comes from KZN. Even Mr. Mantashe is ambiguous he does not know what he must say nor do, he has lost his own direction of the workers’ who made him be where he is. SAFTU I personally warmly welcome you, comrades. let the voice of the workers’ be heard and it SAFTU can stand in for elections in 2019 I will support you, AMANDLA!!! It’s interesting news for the mass of workers in South Africa.My primary concern is related to the workers in the security industry. Security guards etc. The industry is the worst exploiting sector in the country.I wish the new union could try to deal with the unchanging status there. I’m awaiting good thing to happen in favour of communityof workers at large, thatll be ochestrated by SAFTU. SAFTU I personally warmly welcome you, comrades. let the voice of the workers’ be heard and if SAFTU can offer supporters and staff benefits, so that e can have more members at large. 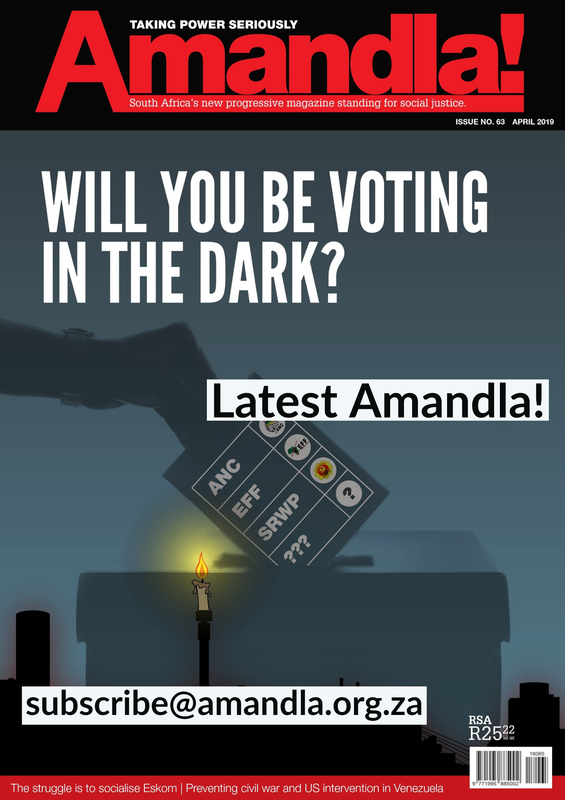 AMANDLA!!! SAFTU I personally warmly support and welcome you on the Unions Playing field, comrades. let the voice of the workers’ be heard and if SAFTU can offer supporters and staff benefits, so that we can have more members at large. AMANDLA!!! let me give samual a botherly free advice; COSATU and its affiliated unions are not working for workers but for its leaders to gain ministerial positions and others in the so-called ruling party (ANC). SAFTU is the only federation which is for workers not for employers. Workers will demand a two digit percentage increment but the COSATU affiliate will negotiate of an insult of 5-6%. 2. Which trade unions are affiliated to SAFTU I congratulate them. How can I contact this federation? I want to know which union are affiliated to as public servants . I’m employed by. WHO CAN I SEND MY IDEAS TO AT SAFTU REGARDING THE ORGANISING AND SKILLS DEVELOPMENT OF THE UNEMPLOYED BY SAFTU AND ITS MEMBER UNIONS? im from Johannesburg .where are your offices based around JHB and please provide me with your contact details. How is saftu going to deal with labour brokers? HI Comdrates im Mbuso (KZn) Dundee I wish to help SAFTU in terms of rectuitments around my area specially farm workers, domestic workers, petrol attendants,workers at different stores so please can u provide me with more details about SAFTU union. Hi I’m peter I’m a correctional officer.popcru has failed us big time.they have failed to fight for a promotion policy for members which is our right.they were able to fight for saps to get their promotion policy and neglected us.for the past 13years or more we have not being promoted.we are in the same ranks.there is some sort of state capture here in our department.its time to find a union that will fight for us unapologetically. Where can we get Saftu offices in Johannesburg? How can we assist SAFTU to grow big in our area, City of Tshwane?I am currently working for a military trade union [SANDU] as a National Regional Organizer for a period of more than ten years. In terms of qualifications, I am having a Diploma In Criminology, Military Qualifications, Certificate in Capacity Building Workshop For Shop-stewards or Office-Bearers and currently i am studying Legal Studies Course with Ox-bridge Academy. The launching of SAFTU is the greatest achievement for oppressed workers, whose living conditions continued to deteriorate under the leadership of COSATU and the governing party. I strongly believe that SAFTU will effectively address our plight. I am a facilitator at an NPO ( Mogolo Academy Abet and Skills Provider)sponsored by Exxaro Coal Mining company at Lephalale. We’re working under the iron fist rule of a very wicked head mistress who is arrogantly violating our labour rights, she is the law unto herself; treating us with utter disrespect, boasting the support of Board Committee which does not care about us. Which union under your federation can we join. Pls send me the contacts. I feel very happy that eventually this new worker giant was born.I’my available to volunteer as recruiter in North West if allowed. My name is Chris. Mahlale, I am working for the South African National Defense Force (SANDF) at Waterkloof, in an HR department, and as a Labour Relations Officer. I am also studying for a Postgraduate in Labour Relations with UNISA. I reside in Pretoria (Thaba Tshwane) and wish to do volunteering work for SAFTU as a labour relations officer in order to broaden my knowledge practically within SAFTU, as this might also help me in furthering my studies. Hi I’m currently in IT, please advise which union I can join as I’m employed by a small company which is exploiting its staff in regards to salaries and working conditions and too many things. How can we register with the union. Hi. I’m Mr Mcese can the saftu urge Doe to bring back busaries for teachers who are still working and who wants to further their studies? Also qualifications and experience must determine salaries for educators. Doe must do away with this thank you think…if you receive another qualification. hi were under cepawu and we need new chemical union that will stand up for us! We have lots of prproblems at work we need a new union please help us guys we don’t get help to other unions because we work fo other contract under a big company now they bay unions. My comment will be on the issue of only considering big cities while people suffer on the ground in deep rural areas people working at Quaries with under very harf conditions.Magwa tea which is made of about 5000 workers who work without paymement under Nehawu.I have a number of people who came to me sreking assistence i hope you will take this matter as more seriousley. Hai I Sphiwe Mthembu from mhlabuyalingana I am working as security officer we didn’t have a union.can we help us how to join the federation infact around Mkhanyakude KZN. Good morning beautiful people of South Africa. Comrade Zwelinzima Vavi is the General Secretary please contact him on 079 182 4170. Comrade Phakedi Moleko is the Deputy General Secretary can be contacted on 082 491 5111. Comrade Mac Chabalala is the President, can be contacted on 078 804 9769. Comrade Nomvume Ralarala is the 1st Deputy President, can be contacted on 076 332 6521.Comrade Patrick Craven is the National Convener and can be contacted on 061 636 6057. Hope you will get the best assistance you need.